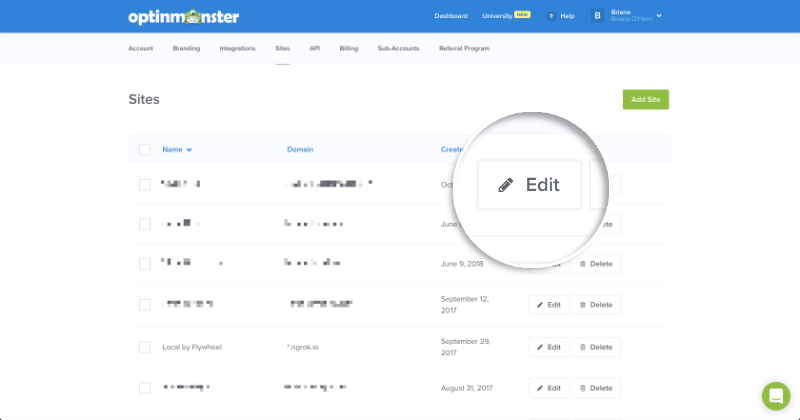 Do you need to add, edit or delete a domain from your OptinMonster account? 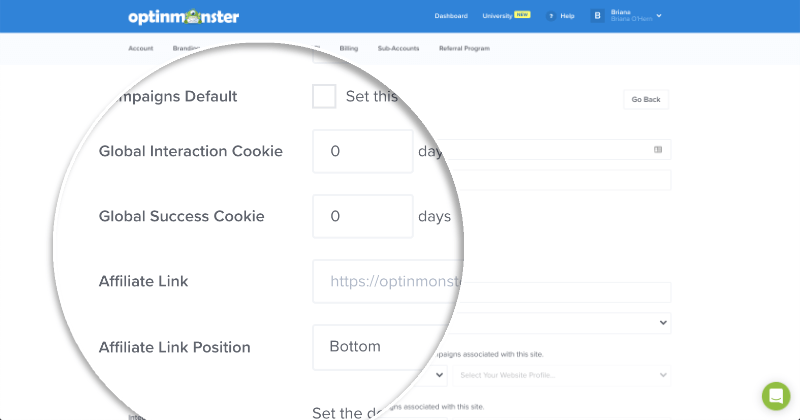 Follow this guide for a walk-through of managing your websites in OptinMonster. How can I allow my campaign to appear on every sub-domain and the top-level domain of my site? First click the User Icon, and click My Account. Next, select Sites from the sub-menu that appears. On this page, you can see all of the sites that are connected to your account. WARNING: If you’re attempting to target a sub-domain (ex: subdomain.domain.com), please read our section on sub-domain targeting. To add a site through the site management page, navigate to the Sites page. Once you are on the main Sites page, select the Add Site button displayed above the list of domains already registered to your account. Name — Enter the name of the domain you’re registering. This is for internal use only. Domain — Enter the domain you’re registering. Enter the Name and Domain into the appropriate fields. You can also optionally set the domain to be the default domain when you create any new campaigns. When you’re finished, select the Save button and your new domain will be successfully registered. 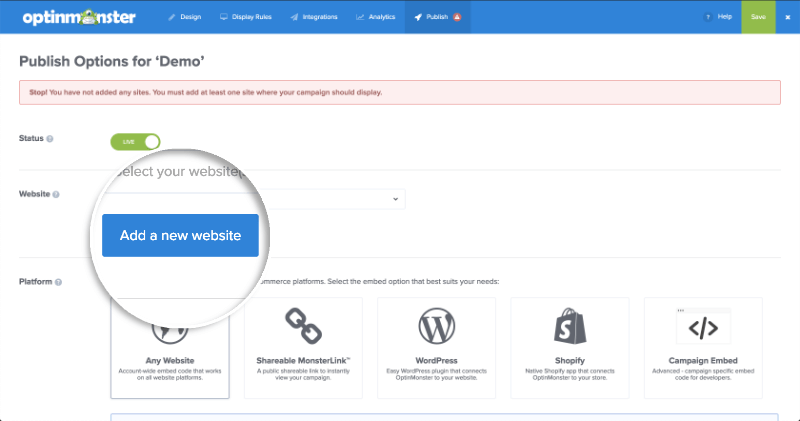 To register a domain through the campaign Builder screen, first, select a campaign from the Dashboard to edit. If you need assistance in creating or editing a campaign, then you can see our guide here. Click in the box to choose a domain already on your site or click Add a new website. Site Name — Enter the name of the domain you’re registering. This is for internal use only. Site Domain — Enter the domain you’re registering. Enter the Site Name and Site Domain, then select the Save Website button to finish adding the domain to your account. Once registered this domain will be available to set for other campaigns in your account as well. Once you’ve finished adding the domain(s) you want your campaign to load on, select the Save button in the builder to save those changes to your campaign. To edit a site, first, navigate to the Sites page. Our current list of connected sites to identify the site you would like to edit. Click its respective Edit button. You will be redirected to a new page where you will find the site’s information for its internally used title, its domain, and additional information (such as Global Cookies, and where you can add an Affiliate Link). Make the desired changes on the domain edit screen, then Save Changes to apply those changes to the domain. There are a number of reasons you may wish to delete a domain from your OptinMonster account, such as if you reach your site limit. IMPORTANT: Deleting a domain from your account will also remove it from any campaigns in your account that are set to load on that domain. If a domain is deleted by mistake you will need to register it again to your account and manually set that domain in the campaign website field for each individual campaign. Proceed with caution. To delete a domain from your OptinMonster account, navigate to the Sites page. Then select the Delete button next to the site you would like to delete. An alert box will appear asking you to confirm the deletion of the domain, once you select the Yes, I’m sure button in the alert box the domain will be deleted. Looking to target sub-domains when registering a domain to your account? 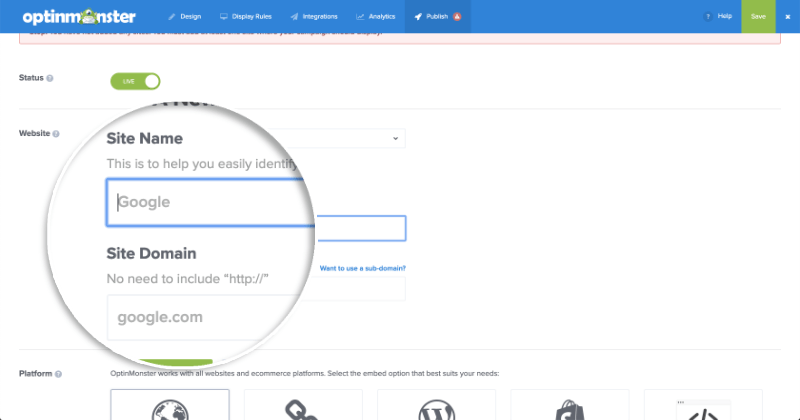 You can specifically target subdomain and main-level domains when registering a domain to your OptinMonster account. Setting a top-level domain will allow your campaign to load only on the main domain of your site. Your campaign will not load on any sub-domain of your site. Setting a sub-domain will allow your campaign to load only on that sub-domain of your site. Your campaign will not load on the top-level domain or any other sub-domain of your site. Setting a wildcard sub-domain will allow your campaign to load on any sub-domain of your site. Your campaign will not load on the top-level domain of your site. Q: How can I allow my campaign to appear on every sub-domain and the top-level domain of my site? A: You can configure your campaign to load everywhere on your site regardless of the sub-domain or the top-level domain by setting both a top-level domain and wildcard sub-domain in the Campaign Website field of the builder.